Did you reach the time of your life when you needed change and wanted to move? No matter what you are going through or planning in the future, having a trusted broker to help you acquire your first home, upgrade your starter home to your dream house, or downsizing now that the kids have grown up and starting a life of their own, is the right thing to do. Before a transaction even begins, a good broker should ask first how much a client can afford and work within the budget. Helping him/her understand this as well as other things, can save the client from huge headache because a good broker can fully explain the obligations as a homeowner as well as added cost like taxes, insurance, and the like that comes in purchasing a home. There are numerous resources in finding a home, made public through the use of the internet but the most up-to-date listing can come from your trusted broker. Not only that, they can even provide you with additional information such as how long a property has been on the market, etc., that you seldom see on other sites. A great broker can and should provide excellent customer service. Not only because he/she is dealing with people, but also clients need assistance pre, during and post sale. Here in Abba 98 Realty, we take pride in having a great relationship with our previous and new clients. 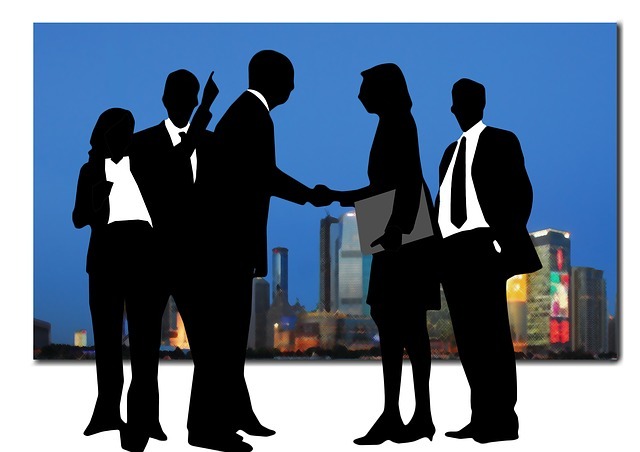 We, not only talk to them because of sales but we also extend our help, if one needs it. I remember an incident that happened few days ago. A previous client helped his son purchase a property in Makati (processed by a different broker). 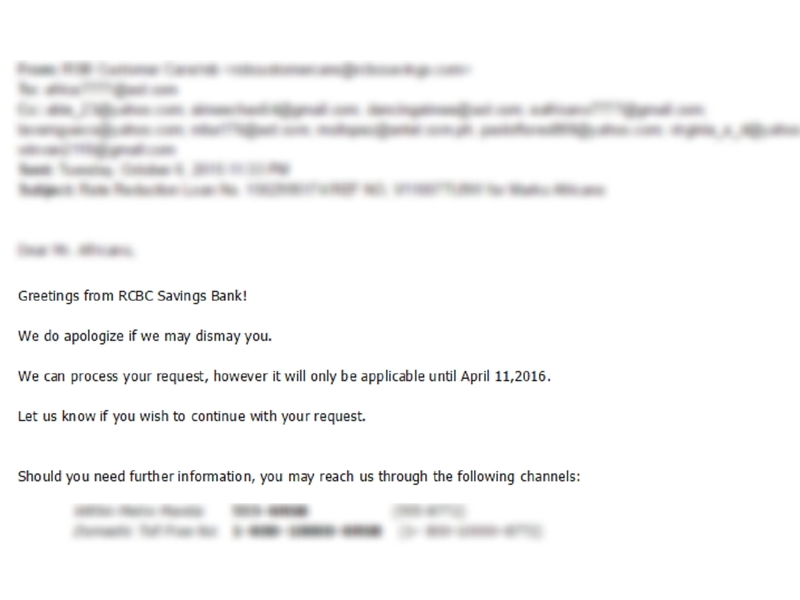 When it is time to finance the lump sum payment through a bank, it was processed by RCBC. The client chose the 5.5% interest rate for his monthly amortization. Banks do give out lower interest rates for a fixed period of one year. So after a year, it means there will be an evaluation on the fixing of the interest rate depending on the current market conditions. So far, bank interests are stable at 6 to 6.5% for a fixing term of 3 to 5 years on the average and a yearly term of 5.5% to 6% which is similar to my client’s case. Unfortunately, the interest rates were raised from their usual 5.5% to 10.5%. 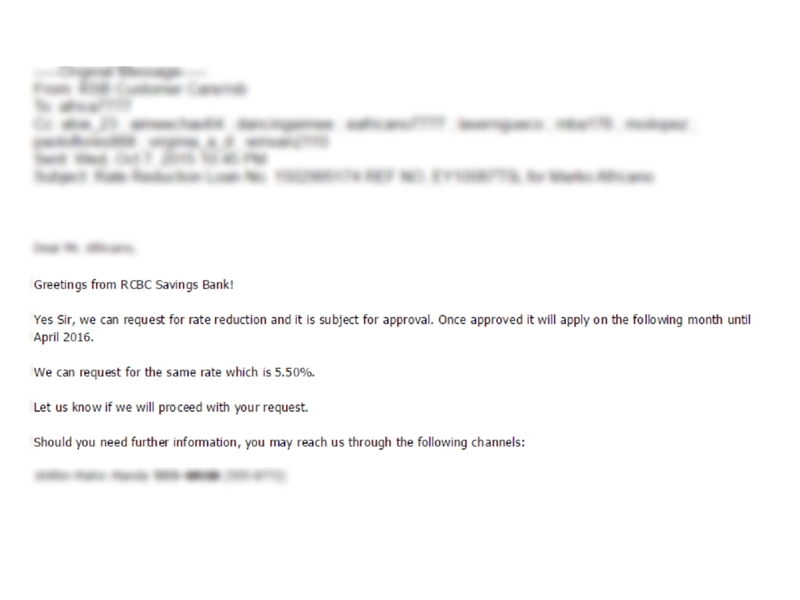 Based on the email thread, you can see that we requested for a reduction. 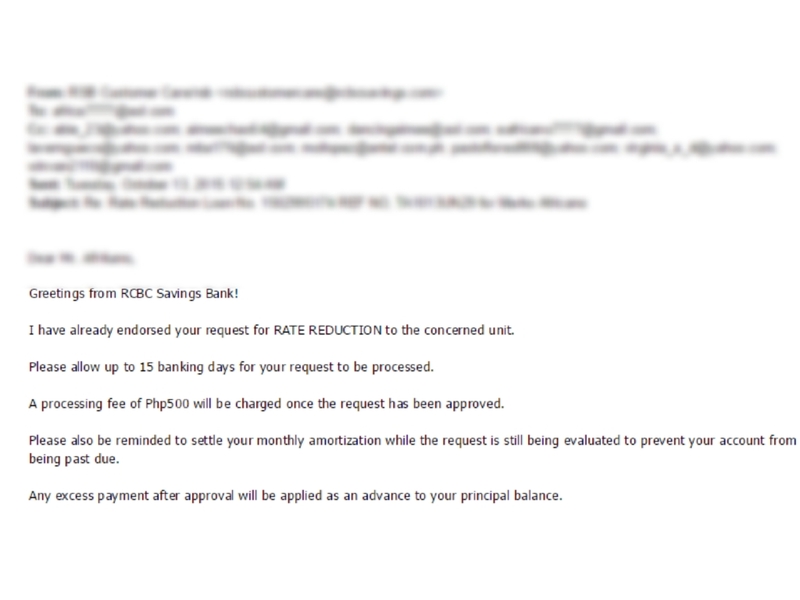 RCBC responded that they can do this but it will fall on April next year which is the date of evaluation. At this time, the client gathered his close friends to email the negative comments. Then, I negotiated with RCBC to approve the request since it will only help them as part of our independent partners through RCBC Greenhills branch and so that they will come out clean with the Filipinos in the US on this decision that they made with a client residing abroad. 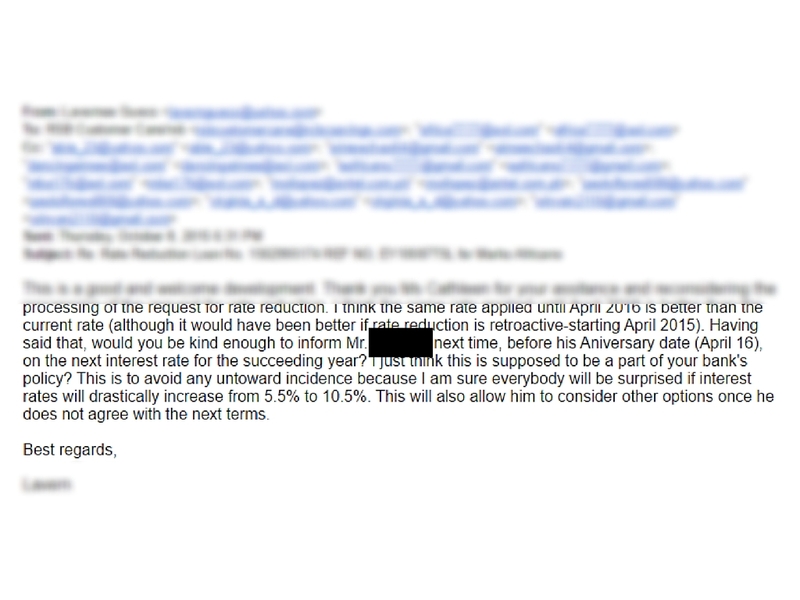 To cut the story short, the bank gave in and changed it back to the original interest of 5.5%. 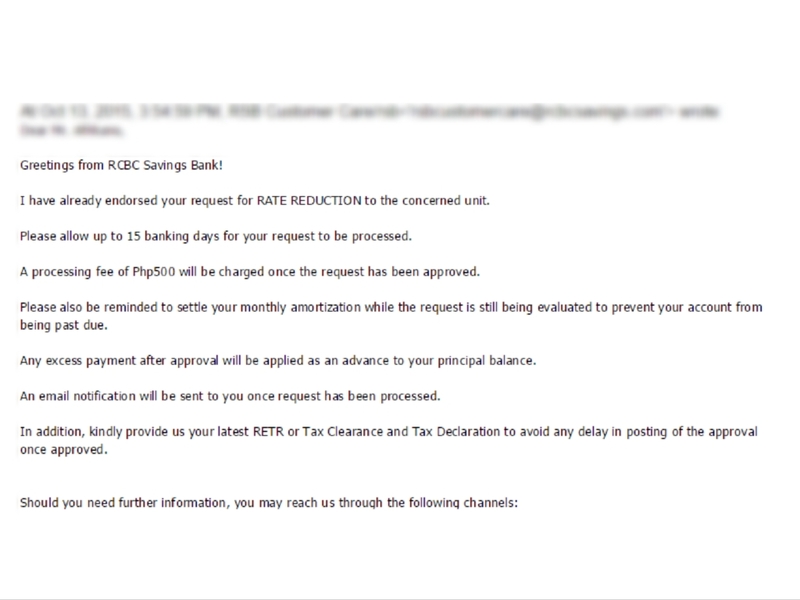 Modesty aside, if not for our love and genuine concern to our clients, this issue would have not been resolved, poor client would have settled in to the bank’s high interest rate and big chunk of his hard-earned money would have been wasted on paying the interest. Another great part of this story is that the client even bought another property, located in Shaw this time, and it is through us again, Abba Realty. Thank you for the trust. If you have concerns, or need help on anything related to your purchases, don’t hesitate to give us a call.